Mixed materials create a detailed Craftsman exterior for this open concept house plan. The great room is open to the island kitchen, and the dining room leads to a cozy screened porch with a fireplace in this house plan. Each bedroom has a walk-in closet, and the master has two. The three car garage enters across from the walk-in pantry into a mud room. The nearby utility room has outdoor access under a covered porch with this house plan. 1st Floor: 2494 Sq. Ft. 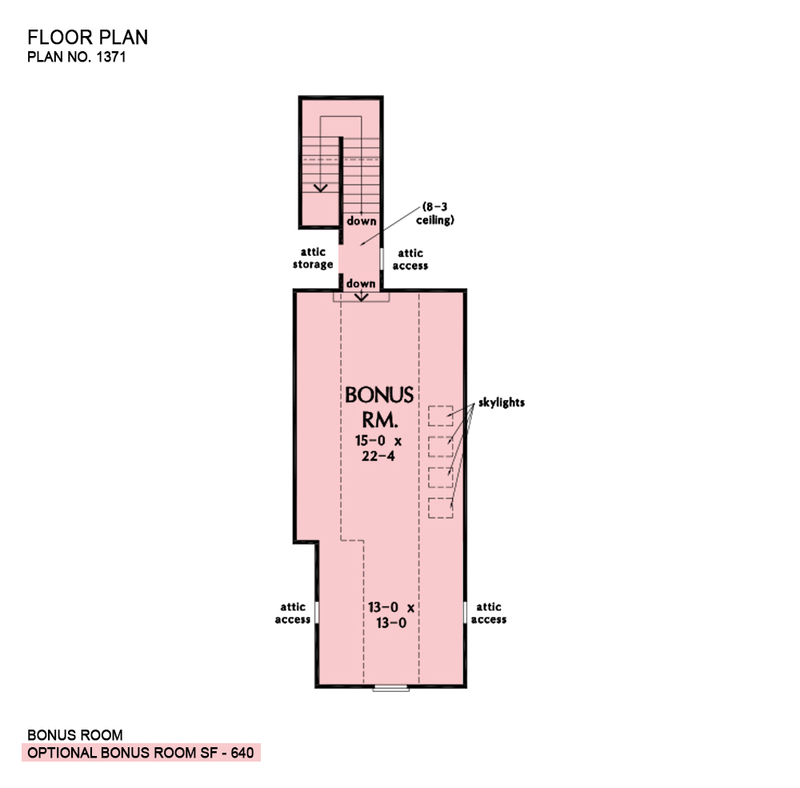 Bonus Room: 640 Sq. Ft.
Porch - Front: 248 Sq. Ft.
Porch - Screened: 229 Sq. Ft.
Porch - Rear: 289 Sq. Ft.
House Dimensions: 76' 4" x 87' 7"
Great Room: 19' 0" x 18' 10"
Foyer (Tray): 7' 0" x 7' 0" x 10' 0"
Dining Room (Tray): 13' 0" x 12' 10" x 10' 6"
Great Room (Cathedral): 19' 0" x 18' 10" x 21' 8"
Kitchen (Flat): 13' 0" x 11' 8" x 9' 0"
Utility Room (Flat): 9' 4" x 8' 8" x 9' 0"
Bonus Room (Clipped): 15' 0" x 22' 4" x 9' 0"
Garage (Flat): 24' 0" x 22' 4" x 0' 0"
Bedroom / Study (Coffered): 12' 0" x 13' 4" x 10' 0"
Bedroom #3 (Flat): 12' 4" x 12' 0" x 9' 0"
Bedroom #4 (Flat): 12' 0" x 12' 4" x 9' 0"
Porch - Front (Flat): 12' 10" x 14' 0" x 10' 0"
Porch - Rear (Flat): 31' 0" x 9' 4" x 9' 0"
Porch - Right (Flat): 6' 0" x 8' 8" x 9' 0"
Porch - Screen (Flat): 14' 6" x 13' 6" x 9' 0"
Patio - Rear (None): 29' 4" x 17' 8" x 0' 0"
Garage Storage Bay (Flat): 9' 4" x 2' 0" x 0' 0"
Mud Room (Flat): 8' 4" x 5' 4" x 9' 0"
Pocket Office (Flat): 4' 8" x 3' 0" x 9' 0"